It’s official: Jesse Williams made sure everyone knew he was woke as hell and he won’t be stopped. 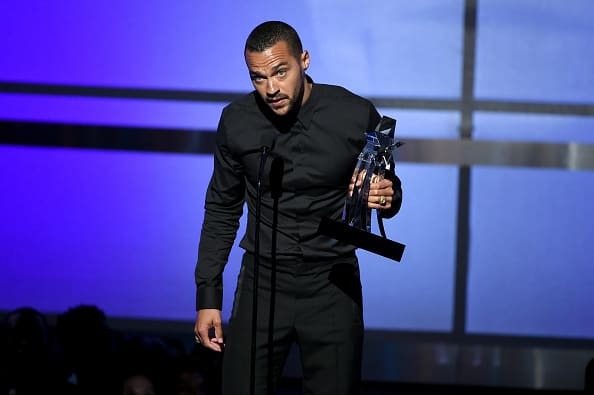 The 34-year-old actor accepted the Humanitarian Award at the BET Awards last night, when he unleashed a powerful—and critical—speech about racism in America and police brutality against unarmed black citizens. “Yesterday would’ve been young Tamir Rice’s 14th birthday, so I don’t want to hear anymore about how far we’ve come when paid public servants can pull a drive-by on a 12-year-old playing alone in a park in broad daylight, killing him on television then going home to make a sandwich,” Williams said to a crowd who had already given him a standing ovation, not even halfway through his speech. Williams’ wasn’t trying to assure black women that black men will do better—it was an apology, and he’s letting black men know they don’t have a choice. Black feminists and scholars have frequently called out black men for mistreating black women. In scholar bell hooks’ book, We Real Cool: Black Men and Masculinity, she argues that black men have abandoned black women because they refuse to conform to the gender norms made by white society, making black men feel emasculated. As a result, some black men have tried to dominate, abuse, ridicule, or refuse to marry black women, leaving us to carry major burdens. “Most black women have been more than willing to surrender control over their hard-earned resources to the men in their lives: father, brothers, lovers, and husbands,” hooks says in her book. We’re are also in constant competition with white women and Eurocentric perceptions of beauty. Where white women are seen as fair and feminine, black women’s features and bodies are considered undesirable — unless those qualities are on white women like Iggy Azalea, Kim Kardashian, or Kylie Jenner. Last night, Williams let it be known that it’s time for black men to stop making excuses and stop seeing strong and resilient black women as undesirable. It&apos;s time for black men to acknowledge that it was this very strength that allowed them to thrive socially and financially—on the backs of black women. Unlike you Jesse Williams doesn&apos;t need a goddamn sticker on his forehead for rallying for the protection and prioritization of Black women. There’s nothing that Williams said that a black actress couldn’t, but he strategically used his privilege, both as a biracial American citizen and as a male actor, to make a political and racially-charged speech without experiencing the same kind of backlash. For black actresses and artists to speak up in an industry that already has so few roles for them, talking about racism can make them appear hostile, angry, and difficult to work with. While older, more established black actresses like Viola Davis and Taraji P. Henson have spoken out about racism in the industry, many younger stars may be afraid or haven’t reached that kind of security yet. Davis, in her 2015 Emmy speech (which received backlash), told the audience, "The only thing that separates women of color from anyone else is opportunity. You cannot win an Emmy for roles that are simply not there." Williams didn’t speak for black actresses and women; he spoke on their behalf because he knew they rarely receive the same platform to speak up, and we have more to lose. And lastly, as if Williams didn’t just bring an entire room to their feet, he ended by paying homage to the #BlackGirlMagic movement: "Just because we&apos;re magic doesn&apos;t mean we&apos;re not real." While Williams shouldn’t be thanked for including black women in his speech, we rarely hear about their sacrifices and contributions—especially from men. Williams fearlessly delivered one of the most powerful comments on racism in contemporary America, and he addressed the very real problem that while we move forward to stop racism in America, we also need to see what we’ve left behind.